Back in 2017, Iberia launched the Iberia Icon credit card which, like many British Airways equivalents, allowed you to earn Avios points on your everyday spending. The new Iberia credit card however has one key difference… it also includes Iberia Plus frequent-flyer status! Following the loss of the Cathay Pacific Marco Polo Club Gold card benefit offered by the American Express Platinum card until 2013, sadly very few credit cards provide airline frequent-flyer status. 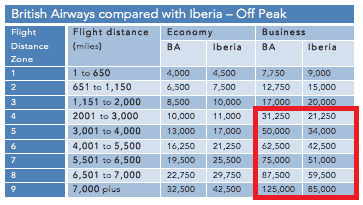 With Plata Iberia Plus elite status offered by the Iberia card, equivalent to British Airways Bronze, I’ve received questions from readers who are attracted to the Iberia Plus card in order to retain frequent-flyer status as well as earning miles (which can easily be transferred to BA, as I’ve written here) on their day-to-day spending. Why would you want earn Avios with a Credit Card? Regular readers of this website will know that Avios points can easily be transferred between British Airways and Iberia accounts. This provides some interesting benefits which have the potential to be able to save you money and allow you to fly further for less… We summarise these benefits below but recommend you read our full review here. Saving Avios – For Business Class flights over 2,000 miles, redeeming Avios points on Iberia is likely to save you a considerable number of Avios points compared to the British Airways equivalent. We’ve highlighted these possible savings in red below. Whilst you’ll have to fly via Madrid, starting a long-haul journey in Spain can reduce taxes significantly. A Business Class British Airways return flight between London and New York would usually cost £651 in taxes alongside 100,000 Avios points. By repositioning to Madrid using 13,000 Avios and £35 in taxes, a flight from Madrid to New York on Iberia would be reduced to just £183 in taxes and 68,000 Avios. This would provide a total saving of 19,000 Avios and £453! Finally with Spanish school holidays differing to the UK, there is usually improved availability on Iberia reward flights for families travelling during school holidays. With Iberia using the frequent-flyer currency Avios points, this opens up significant earning possibilities for UK residents and helps provide an alternative Iberia Airlines credit card. We’ll split this section into two parts. The first will focus on free substitute Iberia credit cards. The second will look at premium cards which come with the dreaded associated annual fees. 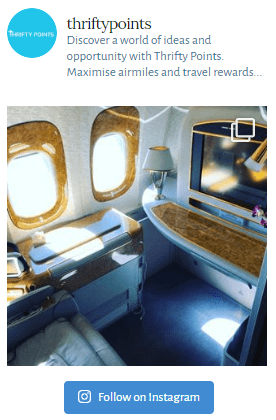 American Express Gold Card (reviewed here) – Free for the first year, this card offers an exceptional sign-up bonus of 20,000 points (equivalent to 20,000 Iberia Avios points) when you spend £2,000 on the card in the first 3 months. You’ll also earn one point for every £1 spent on the card as well as receiving two free airport lounge passes. You can increase the sign-up bonus to 22,000 points using this link. British Airways Premium Plus Card (reviewed here) – With one of the most generous credit card perks in the UK market, this card is one of our favourites currently available to UK residents. Whilst it comes with an annual fee of £195, this is somewhat offset by the 25,000 Avios points sign-up bonus (26,000 Avios if you use this link and scrolling down to the correct card). Where it provides real value is the 2-4-1 voucher when you spend £10,000 on the card in a membership year. I recently used this voucher coupled with the Gold card above to redeem two BA First Class flights from London to Sao Paulo – read my full review here which includes a step-by-step guide enabling you to earn enough points to fly First Class! Unfortunately however this cannot be used on Iberia flights. How do these compare to the Iberia Icon Credit Card? You’ll actually be happy to hear that by not being able to sign up to the Iberia Icon credit card you’re likely to get a better deal with one of the cards mentioned above. 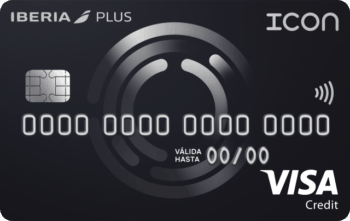 The Iberia Plus Icon credit card comes with an annual fee of €90, which puts it in the bracket of a ‘premium credit card’. Secondly you’ll also be happy to hear that the sign-up bonus is less at 15,000 Avios points. This is however very generous for a Visa card. Finally, and the elephant in the room – Iberia Plus Plata status, which is equivalent to oneworld Ruby or British Airways Bronze. I’m afraid to say that for UK residents there’s currently no way of gaining airline status through spending money on credit cards. Whilst this may change in the future I personally hope it doesn’t as it’ll likely result in either the devaluing of the status or alternatively the decline of the other benefits offered by the credit card. I’m not sure what I’d do if we lost the 2-4-1 voucher!